Rhode Island leaders say the former highway land is the best chance for economic development in a state where the average unemployment rate last year of 9.5 percent was second-worst in the country. They hope projects on the land will generate jobs and create living spaces for people who would work in Rhode Island. I really don’t see this as our “best chance.” It is one of many things we need to be working on in a little state with a devastated economy to turn ourselves around. This is a project that is going to take decades of work (see Capital Center) yielding milestones along the way that are smaller than the whole that we get so worked up talking about. 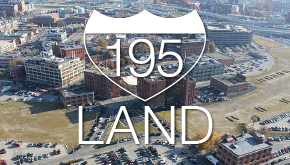 It is 19 developable acres in a city that has far more than 19 developable acres already existing within it. When our ‘leaders’ get all hyperbolic about this project, I get worried(er). Somebody mentioned that there were rumors of Brown wanting to relocate it’s football stadium on the land. I’m not much for rumors, but I think this is interesting. Rightfully so, people are definitely concerned about the landing becoming consumed by nonprofits that don’t need to pay property tax. However, is it beyond possibility to develop projects with Brown for which they DO pay property tax? While the stadium is most likely just a rumor, I wouldn’t have a problem with it as long as it isn’t tax exempt. My other big concern is that it wouldn’t be used for the majority of the year; however, I think there could be some creative ways to make it work. Similar to the Biltmore Garage with the new storefronts below, how about a stadium that has ground level retail / restaurant space surrounding it? It could be used for outdoor concerts and festivals when not in use. Time to think outside of the “parcel.” Google isn’t coming here anytime soon. Sidenote: your parking map is missing the structured parking beneath the courtyard at the state offices. Let’s be realistic – it’s not as though any for-profit developer of this land is not going to get a massive tax deal. Adam, I hear you. There is no doubt that Brown and the other colleges have made an effort to pay taxes that are needed for the City to avoid financial ruin. Is it enough, probably not. That said, I’ve heard many people express fear that Brown is aiming to gobble up all of the 195 land, which I think are overblown. If Brown wants it, then go for it. Make an offer, and let the negotiating unfold. As long as we are heading towards a more livable work/play/live CIty, and Brown fits in with that, then I’m all for it. Of course, what I don’t want is to see the equivalent of the iron gates surrounding University Hall being erected around the 195 land. Brown is a part of the picture, can build with the goal of being a part of–not apart from–the City. They can be a catalyst for further development. Let them build a stadium that includes retail and restaurant space–even a supermarket–within the structure. I’m all for it. But maybe I’m too optimistic.